It’s reasonable to believe that most workplace deaths and injuries could have been prevented. There are numerous safety regulations set in place by the Occupational Health and Safety Administration, the federal agency charged with overseeing workplace safety, but there were still 4,585 workplace fatalities in 2013*. Protect Environmental knows that companies may not be able to constantly invest in new safety equipment if they want to stay competitive but consistent and comprehensive training can be a low cost way to stay compliant and avoid accidents. Below are a few training areas companies can go over with employees to prevent injuries. Chemical Awareness – There are millions of chemical products that are available for use in the workplace. The more dangerous chemicals aren’t only used in large factories; employees at small shops can be at risk for exposure too. Take the time to train employees on what chemicals are present and what the risk is from fires or overexposure. Initial Actions During an Emergency – Whether there is a fire, earthquake, flood or other disaster, the very first responders are the people present when it’s happening. Employees should be trained on how to handle likely situations in order to mitigate damage to property or injuries. 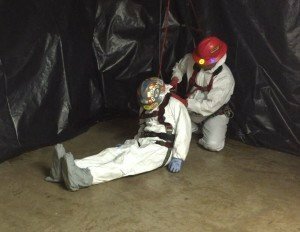 This includes planning escape routes, defining areas to shelter in place, and assigning duties like shutting down equipment or performing initial spill containment. How to read a Safety Data Sheet – When exposure to a chemical occurs, whether by accident or as part of regular duties, an employee should understand how the exposure will affect them. The first step would be to make sure they understand the format and terminology in a SDS. Once they are familiar with Safety Data Sheets in general, they can read the safety data sheets for the chemicals that are used at their workplace. Proper Equipment use – There are lots of safety devices on the market that can cover an employee from head to toe but if employees don’t know when and how to use the equipment available, it does no one any good. For example, a Tyvek suit may cover most of the body but a person working with strong acids will only have very limited protection. The acids splashed on the suit could corrode the material and come into contact with the skin in a short period of time. Also, an employee who is using a respirator but doesn’t know which cartridges to use is at risk of lung damage or asphyxiation. Protect technicians practicing confined space rescue. Proper training is the first step toward creating a safety oriented workforce. Supervisors should intervene when unsafe practices are being followed but should also be encouraging when employees follow procedures. Employees should be reminded of the potential consequences of accidents and also be allowed the proper amount of time to do tasks in a safe manner. Employers can also engage with their workers on a regular basis to find ways to improve safety and address any concerns. The emergency response teams at Protect are constantly reviewing materials, checking equipment practicing for chemical events large and small. By ingraining safe practices into the environment of a workplace, it becomes a habit for employees and when the job is done everyone gets to go home.